Cairo is Anubis' brother and came to us when he was 4 months old. He is a mamma's boy and loves to snuggle on the couch or on the bed. He is truly a couch potato. Where his brother is stand-offish, Cairo is a complete love. He likes to smile with his big, toothy grin and give hugs! He is the polar opposite of Anubis which is funny considering they are littermates. Cairo loves to lay in the sun and likes nothing more than to be close to his family. He is a very mellow and laid back boy that loves to cuddle on the bed and loves to sleep in whenever possible! He is a fantastic lure courser and loves to chase the bunny. At his forth lure coursing trial Cairo not only won the open stakes, he also went Best of Breed and then won Best in Field over a Whippet and Saluki! Like his brother, Cairo has ventured into the realm of straight/oval track racing. So far he is pretty good at it but he does not like wearing a muzzle. At the age of 4.5 years old Cairo entered the show ring for the very first time to compete in the altered classes. He did fantastic and loved being in the ring. Being a very food motivated hound he listened and did everything he was supposed to. In 2011 Cairo was ranked the #7 PH in the nation running in LGRA! Cairo also was ranked #20 in the nation for PHs in AKC Lure Coursing for 2011! Cairo became only the 2nd PH ever to earn his UKC Altered Champion title and only the 3rd ever to win an Altered Best in Show!! In 2015, Cairo finished as the #8 PH in AKC Lure Coursing (pretty good for an 8 year old!!) and was a top 15 PH for ASFA Lure Coursing. 03/26/2011 Western Washington Whippet Assoc. 10/01/2011 Western Washington Whippet Assoc. Altered BM, BOB, Group 2, 25 pts New UKC AltCh!!!!! 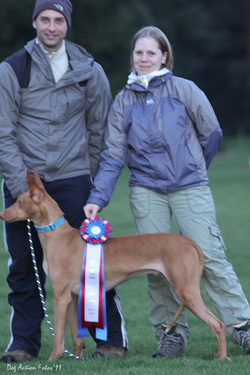 1st Place, BOB, 3 pts (2nd major) New Field Champion!! 1st Place, 8 pts New Field Champion!!!! !